I have been working in the veterinary field since 1985. I began as a technician at Melrose Pet Clinic where we worked on dogs and cats. I completed my BA in English Literature from San Diego State University. 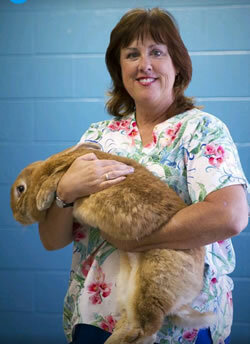 I then went on to Mesa College to complete the Registered Veterinary Technician (RVT) program. Upon graduation in 1991, I began work at the Avian and Exotic Animal Hospital and have been the evening receptionist ever since. What I enjoy most about working here is watching the clients come in, not knowing much about their unique pets. When they leave our hospital, they have the knowledge needed to keep their pets happy and healthy. I also enjoy seeing the clients interact with the rest of the staff. It’s exciting to me that everyone who works here has a genuine interest and love of the animals that come through our doors. Each person here has interests in different species and is more than happy to share their knowledge with our clients. When I am not at work, I enjoy spending time at home with my own pets. My menagerie includes my ten cats, four little dogs, and my backyard filled with rescued bunnies that I fix and find homes for. In my spare time, I also enjoy singing in my church choir, gardening, reading, working out at the gym and walking my dogs.